Visual Studio Code>Other>vscode-tcmergeNew to Visual Studio Code? Get it now. Note: This extension is in its early phase. If you find bugs, have feature requests or good ideas, please create an issue. This extension is highly inspired by the CLI package debitoor/tcmerge. Selection this command will stage, commit and push all changes using a provided commit/branch input. The input will replace all spaces so that its valid as a branch name. Will create a pull request of the branch, using input as description for the pull request. Creates a ready branch of your branch that your build server is listening for. That is, it will a push a branch ready/<current-branch-name>/<timestamp> to origin. Contributes multiple selections based on its current state, defined by if you have saved an access token. An access token is necessary for the command tcmerge: Create pull request to work. 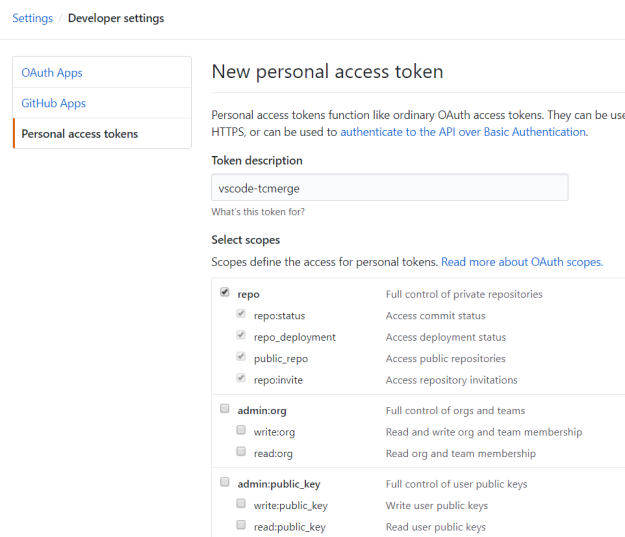 You need to create an access token to your Github account on Github. It requires access to scope repo if you expect to create pull requests in private repositories, otherwise you can just select public_repo. Delete access token - will remove the access token from storage. This command cannot be reverted. Update access token - will update the access token accordingly to a given input. This command cannot be reverted. Extension logo is designed and created by Mads Uldbæk. Please do not re-use, modify or change it in anyway without contacting him and having his approval first.